We are all vulnerable to stress, and it is paramount importance that a good Employer can help an Employee manage stress. Stress in the workplace has become a major issue over the last decade, with over 80% of businesses surveyed identifying stress in their employees at some point in time. But what is stress and can’t a bit of pressure be a good thing in the workplace? Stress is the mind and body’s reaction to change. It’s not a disease, however the long term effects of stress can be highly detrimental to your health. Depression, anxiety and heart disease are just some of the effects that can occur when someone experiences long term stress. 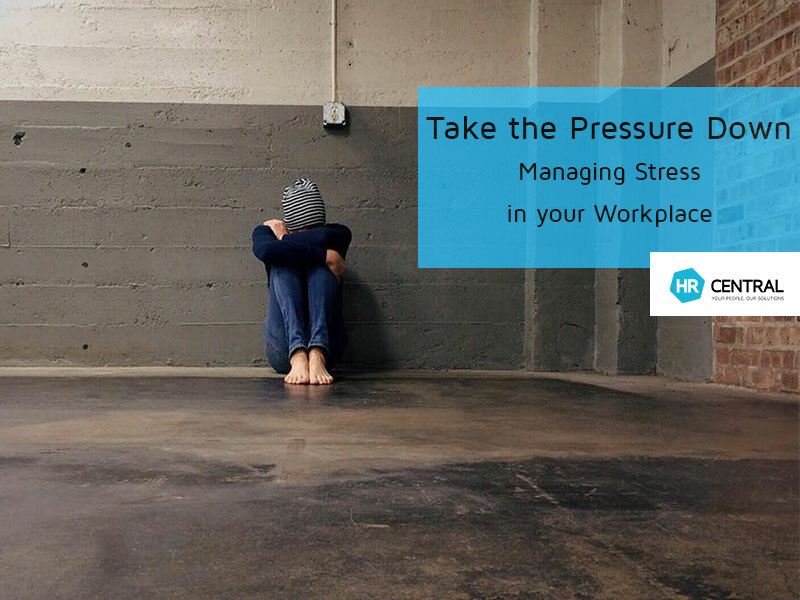 There is a big difference between a little bit of pressure which can improve someone’s performance at work versus excessive and unrealistic pressure which can cause stress and illness. As a Manager, workplace stress is your concern, and you need to help your employees manage stress appropriately. It is your duty by law to ensure that your employees aren’t made ill by their work and that you manage stress in your work place appropriately. Employers who don’t take stress related claims seriously run the risk of having to pay large compensation payouts to staff who have suffered ill health due to workplace stress. Stressed out employees can also have a flow on affect to their colleagues, creating a down turn in productivity. Focus on your staff and if you feel there may be a stress issue – be proactive and deal with the situation, don’t let it fester. So how can you help manage stress in your employees? Firstly, you need to conduct a risk assessment within your business. A risk assessment looks for pressures at work, that could cause high levels of stress. By identifying these, you can then determine who might be impacted and what you can do to prevent any build-up of stress. Involving your employees and/or any Health and Safety officers can be highly beneficial in this process. Along with this, more often than not, simply by talking to your staff can provide you with any stress indicators. If there is a sense of disengagement within the team; perhaps a higher level of personal/sick days, regular tardiness or frequent staff turnover – something may be amiss. Ask your staff if everything is ok and listen to their answers. In addition, hold a meeting and ask your team how they feel about their work and work environment. Ask for ideas and feedback to improve or change some things. So what happens when you have been made aware of stress within your team? There’s no best, single way to tackle this as every workplace and it’s pressures are different. However, here are a couple of tips on how you can handle a stress-related situation. Identify the problem (discuss in an open and honest way with your staff member/s, allowing them to explain the situation and what it means/and how it is affecting them). Once the problem has been identified, ask for any ideas on how to they could see ways to improve the situation. Some changes could be; team restructuring, new equipment, changing processes, or creating new systems. Monitor any changes made to ensure they are having the positive effect intended. And, finally, lead by example. As a Manager you can have the positive role of teaching employee about the importance of reducing stress in the workplace. Providing a supportive environment by dealing with staff in a sensitive and caring fashion. Regularly monitoring staff engagement and satisfaction. Ensuring staff feel confident and comfortable to talk to about any problems or concerns. Fostering a collaborative team approach with positive relationships between all employees.